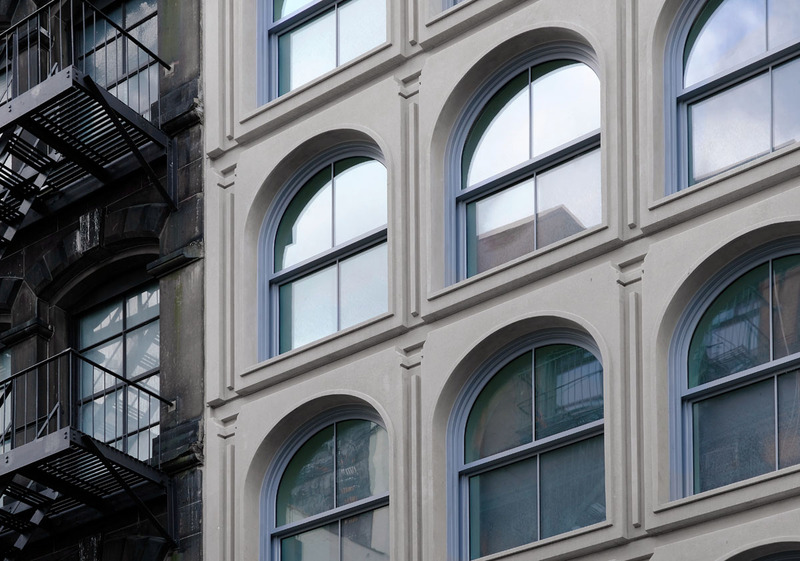 Completed this year, 150 Wooster is an eight-story, mixed-use infill project for KUB Capital that offers a contemporary version of Soho loft living in a historic district. 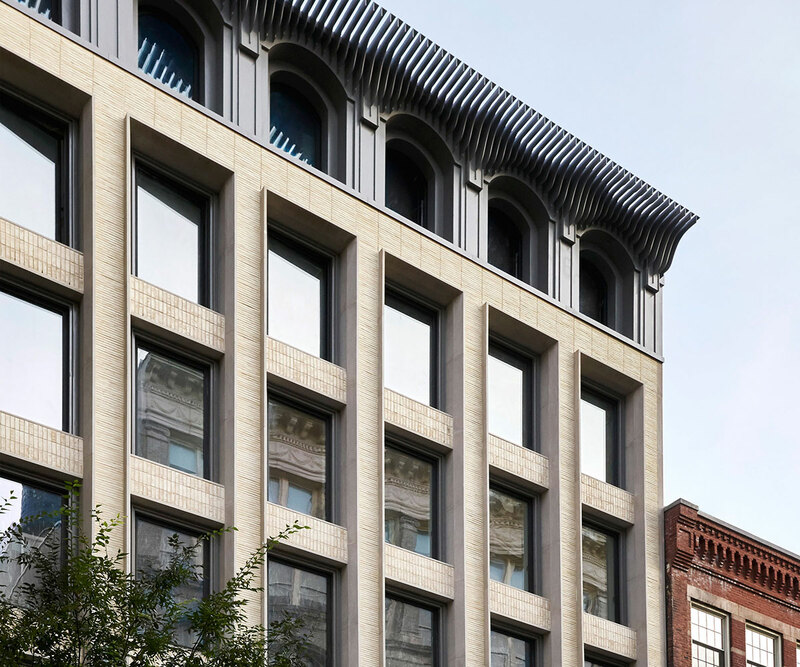 HTO Architect worked with the New York City Planning Commission and the Landmarks Preservation Commission to deliver the project, which features a custom-detailed brick facade articulated with limestone and painted steel ornamentation. Daniel Schillberg, managing director of design and architecture at KUB Capital, said this infill project is located on one of the last developable lots in Soho. “This was one of the last ground-up buildings in Soho and will probably be the last,” he said. Soho’s predominantly cast iron structures date from 1830s to the 1850s, the surprisingly narrow spectrum of time when the majority of construction occured. The speed of construction in this neighborhood and others like it was achieved by means of prefabrication and a “kit of parts” mentality that was made possible due to advances in cast iron technology that paralleled mass industrialization. KUB said the project was inspired by this context, along with masonry structures that surround site. Depth of the facade was a key consideration in the design. The facade arranges a large operable window unit measuring over four by eight feet into eight bays, finding a sweet spot between energy code's permitted window-to-wall ratio, historic compositional proportions, and window manufacturer fabrication limitations. The resulting design, which received unanimous Landmarks approval, was approximately a year-long process. To achieve the desired effect, the architects looked to materials common to the area—brick and limestone—but sought out detailing methods that produce a refined contemporary aesthetic to, in their words, "push the building into our modern times." This led to the refinement of a limestone trim detail that projects four inches beyond a primary facade of Petersen Tegl Kolumba brick. The masonry veneer is a long and thin proportion arranged in a stack bond with a tight 3/8" mortar joint to privilege the color of the brick over the mortar color. "These Petersen bricks have a lot of texture. They're essentially hand made which lead to a lot of ridges and good imperfections," said Schillberg. Window units are defined by a dark metal frame set 16 inches back from the face of the building, exposing Indiana limestone, which swells to meet the window frame assembly in one precise angular taper. The masonry installers built a single window bay mockup by looking at the detailing of the spandrel bricks, limestone trim, and the primary facade bricks. One of the constructional challenges was the weight of the limestone trim, which required complex drop beams with specific edge detailing for the concrete superstructure. The limestone, which is pinned back to these moments in the structure of the building, acts as a modified custom brick lintel to support the masonry veneer. Another key detail of the project is the custom metal work on the storefront and cornice. Both elements were inspired by traditional cast iron detailing involving prefabricated modules of profiled galvanized steel sheets. The cornice essentially functions as a miniature brise-soleil, and is composed of custom-profiled metal fins. "I loved the idea of having a cornice where, as you approach the building, it evoked the sculptural shaping of a cornice, but as you get underneath it, it actually disappeared into thin elements that allow light through," Schillberg said. The brick manufacturer, Petersen Tegl, is a small family-run Danish brickworks company founded more than 200 years ago. Their products are still handmade through a carefully crafted traditional process of hand-pressed, coal-fired production. This produces authentic bricks with a variety of signature light and dark shades. In addition to helping new buildings meld with older and more classic surroundings, Petersen Tegl’s handmade bricks are also helping to revive the idea of the skilled artisan and masonry construction. They’re popular in New York: A developer on Manhattan’s Upper East Side working on the tallest building in the neighborhood north of 72nd Street is utilizing nearly 600,000 Petersen Tegl bricks to connect the structure to its art deco context. Across the river in Brooklyn, two developers have launched luxury condo projects, 145 President and 211 Schermerhorn, each featuring the handcrafted aesthetic of a Petersen Tegl brick facade. On October 5, the New York Landmarks Preservation Foundation hosted its annual Lunch at a Landmark at a historic building in midtown Manhattan. 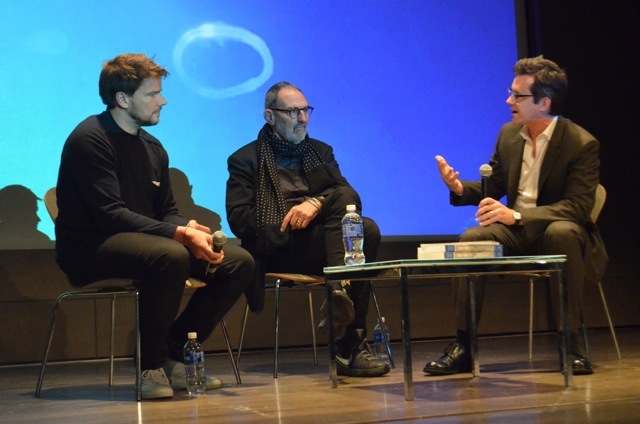 As always, the event was well attended by prominent architects, preservationists, and designers, as well as experts, supporters, and enthusiasts of those fields. New Yorker staff writer Adam Gopnik introduced Lord Richard Rogers warmly—so much so that when Rogers took the microphone, he joked that “we should all just go home now.” Gopnik focused on Rogers’s approach to human-centric design, saying, “The core idea of liberal humanism is not that man is the measure of all things, but that all things can be measured by man and by woman.” This focus was in conjunction with Rogers’ new book A Place for all People, which further explains the architect’s approach to modernism, civic value, and urban design. Modernism is a funny word, artistically and architecturally speaking. Once the modernists dubbed themselves as such, either in a stroke of hubris or marketing genius, the rest of us were stuck with postmodernism, and even post-postmodernism. 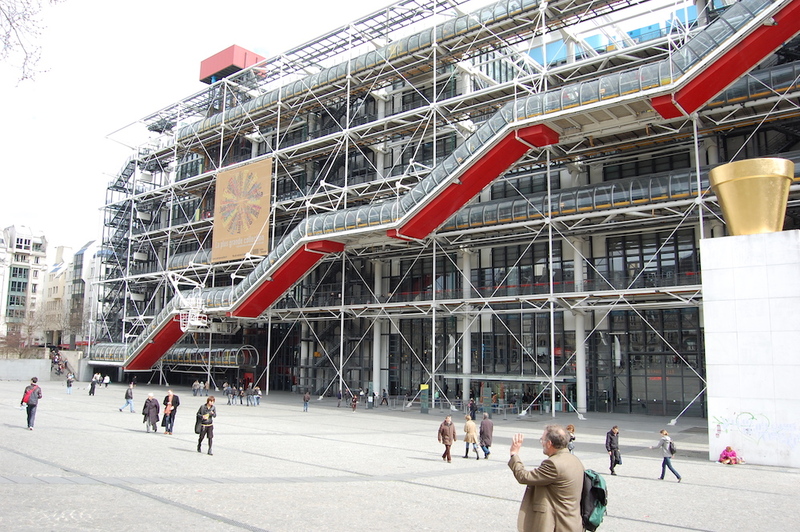 In his talk at “Lunch at a Landmark,” Rogers reframed the word, explaining: “Modernism is good architecture of its time, advanced by technology, by changes in economics, and by changes in sociology. What is happening at that time? What is the zeitgeist?” He proceeded to walk through a brief timeline of architectural works, from the primitive hut and Brunelleschi’s dome, to Palazzo Vecchio in Florence, Italy, and Piazza San Marco in Venice, citing the different styles and renovations along the way. Through these examples he identified two types of architecture: “Architecture that is challenging, that is different, and architecture that just disappears within its current state,” Rogers said. “I’m not saying one is better than the other, but it is important to concede the two differences.” In particular, he focused on the five main iconic buildings in the Piazza San Marco, highlighting how the Renaissance elements set off Medievalism and how each building relates to the others, despite the many elements at play. In his own work, he initially found some difficultly relating architecture to its surroundings. When designing the Lloyd’s building and thinking about how it would fit in with its neighbors, Rogers was concerned. 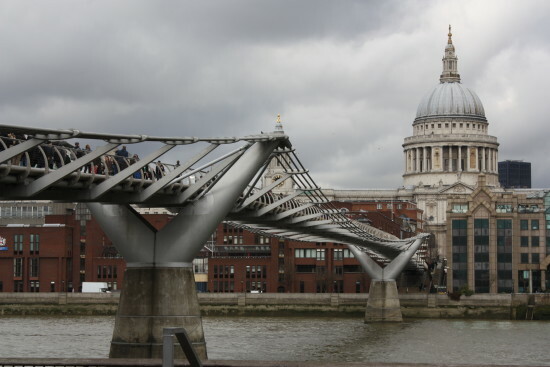 “Fifty percent of the City of London has been rebuilt in the last forty years, so what am I meant to be relating to? How do you relate to the existing conditions when you are aware that they might not be there in a few years’ time? And you mourn the fact that the buildings do not fit their purpose for any length of time—it’s about sustainability, it’s about energy, and it’s about waste of energy. One of our goals was to make the Lloyd’s building last into the next century (which we accomplished). We wanted a building that could change, that could adapt—a big flexible space. When we started designing Lloyds the height of technology was the Xerox machine. We have to interpret, or try to interpret the conflict of continuous change.” He faced a similar quandary with the Centre Georges Pompidou he did with Renzo Piano, which partially informed the building’s open layout, external structure, and the revered piazza that Rogers described as “a cross between Times Square in the 1970s and the British Museum…. A place for people, a place for all people.” Now, it is undergoing renovations to update the HVAC systems and such, but still remains a relevant structure. Rogers touched on other projects as well, from Las Arenas in Barcelona to Three World Trade Center in New York. He concluded by good-naturedly hoping that at the very least, it won’t earn a moniker of 'cheese grater,' like the Leadenhall. “Londoners are very creative with their nicknames,” he quipped. He doesn’t take it too personally though, as this is just one of many jabs at modernism endured by all top architects. “Prince Charles once said the Luftwaffe did less damage than I did…. He might be right.” We have a hunch that Rogers won’t let the royal architecture criticism affect him, or his modern buildings, too much.